All of us serving in IT are being asked to do more with less. Given the emergence of digital tools and connectivity, there is no reason to expect less. Tools and processes are critical if we hope to enable health and wellness transformation, but leadership trumps all. When I study major blockers in my own experience, it comes down to leadership. Leaders who continue to use old formulas are what I call old math. We need new math. We must become selfless leaders. A selfless leader is a humble servant who puts the organizations and other individuals before themselves. They eat last. They sleep last. They give away their best. They open doors. They sacrifice. They lead by example. 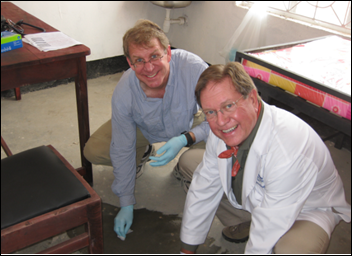 Above is a picture of the then-CEOs of Texas Health Resources and University of North Texas Health Sciences cleaning human waste in the Tanzanian medical clinic we co-founded in 2011. He who wants to be first among us needs to take the last place. We are all proud of our domains and departments. We all love to show off our results. Super! You should be proud. But do not let pride harden your heart and cause you to stumble to the point you forget it’s about the organization’s mission and vision and not your trophy case. Always keep the organization’s best interest first. The rest will follow. I learned over the years that the more control I give up, the more influence I gain. I once gave up my CMIO, CNIO, and BI and the IT influence did not suffer, but was multiplied many-fold. The organization prospered. It is backwards math, but it is what I refer to as new math. Sometimes we can hold on so tightly to our own people that we squeeze life from them. Let them go. If they want to stay, they will, but let them choose. We are doing our people a disservice when we don’t let them reach their full potential. Often, it drives them to leave the organization. Instead, let’s give them room to grow with us. Nothing better to see one of your own grow and surpass you. That is a compliment. I can point to several people who served with me that are way better. Many went on to surpass me. I love it! When someone makes a hero out of one of my peers or team, I am not threatened. I got over that long ago. Let them shine. Help them shine. Let them move on and flourish. Give away your best. The less we hold on, the less we stress. The more we give away, the more we receive. Every time I have given away my best, someone else comes along, and we hit a new level. Another head-scratching new math principle. You are a gifted leader only when you replicate yourself. As good as you are, you are only one person. You are limited to one. One is too small a number. When you replicate yourself, you open the gift of multiplicity. It is what we called in the Army a force multiplier. Instead of one of you, there are now two, and you accomplish 4x. Yep, more funky new math. Some people like to brag about the greatness of their leadership, but the first thing I ask about is the pipeline. Yep, the pipeline of fresh talent that then infuses the company and the industry and the world. How many CIOs have you helped build? A great test is voluntary followership. If you go to another company, how many people follow you? How many people pack their bags and follow you? Or are you one of those leaders who attend every meeting of your subordinate leaders? Are you afraid to let your directors or manager lead without you there? Tough questions, but we have to be real. How is your new math? Would you sacrifice for one another? I had to ask myself that many times as a combat-trained medic and combat engineer officer. Thankfully, I never faced battle, but I prepared as if I was getting called to the front lines. We soldiers asked ourselves all the time if we could trust our foxhole buddies. Would they jump on that grenade? Would they take a bullet from your flank? When in public, we must be unified. We can and should respectfully fight behind the scenes to challenge one another before finalizing decisions and closing ranks. My expectation is that publicly we are one and fight for one another. If someone is bullied, you stand up. If someone is struggling, you walk beside them and carry them if needed. If someone is lost, you help them with directions. If someone is new, you introduce them and never leave them. You give up your seat at the table. Secure leaders go out of their way to give up their seat. The more you serve and protect and seek the best in another before yourself, the brighter you shine. New math. You have to love it. Imagine if we had 10 gifted leaders, all concentrated in one area. How does that benefit our patients? Alternatively, what if we took those 10 gifted leaders and strategically placed them throughout the organization? We could change the world. New math. None of us are perfect. I am likely the most imperfect and average leader there is. But I embrace change and strive to put others before myself. I see many of my gaps and get help. I am unafraid to ask for help. I am unafraid to say I don’t have any idea. When is the last time you proactively sought training or reached out to a coach or formal mentor? Self-reflect. Assess your gaps, Make a plan. Fill the gap. Wash feet. Repeat. Constantly. New math. Ed encourages your interaction by clicking the comments link below. He can be followed on LinkedIn, Facebook, and Twitter. 1. They already know everything. 2. Their loyalty to one another is the most important component of the work. 3. They are assured to perform just as poorly as at their last site (which they just left) because they are incapable of integrating with others. 4. Since they move as a herd they are never held accountable for the longer term impacts of their decisions, which assures that they simply repeat the same mistakes over and over. This is like encountering a group of 7 year old kids that all go through life together and no one ages, no one gains wisdom, no one learns how to embrace new and dynamic growth. But it’s all really cool and they love following whoever the leader is, because, like, they have it all figured out! I don’t know Ed from Adam, but what a comfort it must be to have arrived at a place where you can openly state is that one of your goals is as a manager is to develop a following that will up-root and follow you to wherever. And yet they will do it over and over. Remarkable. The most effective mentors/managers I’ve encountered were the ones that left folks behind who carried forward their approach to the work in an ever expanding circle. Someone call Winnebago – there may be a market here like the retirees that move from Amazon center to Amazon center seasonally for work. Sometimes when I read these articles I wonder (a) is this all some sort of gag, that HIT folks will get a kick out of and (2) if this is real – does the person writing this stuff realize that NOTHING ever goes away on the internet, which means that his entire leadership stack at his current, past and prospective employers will read this stuff? I very much appreciate and look forward to your posts. Thank you!